Professor of English Richard Yarborough is the recipient of the 2016 Darwin T. Turner Distinguished Scholar Award from the African American Literature and Culture Society. The society recognizes outstanding achievements and scholars to encourage dialogue, scholarly publications and projects devoted to the study of African American literature and culture. 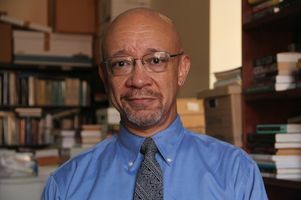 Yarborough teaches African American literature and 19th and 20th century American fiction, and his scholarly work has been published extensively. He was a founder of respected "The Library of Black Literature" reprint series at Northeastern University Press, now published by the University Press of New England. He is a faculty research associate with the Ralph J. Bunche Center for African American Studies, which he directed for six years. Yarborough is a recipient of the UCLA Academic Senate's Diversity, Equity and Inclusion Award and the UCLA Distinguished Teaching Award, and he has been recognized by the UCLA African Student Union and honored by the city and county of Los Angeles. To learn more about Yarborough's contributions to UCLA and the field of African American literature, click here.